Get your own personal set of instructions! Learn how to cook with the Precise Heat™ brand low-pressure pressure cooker. 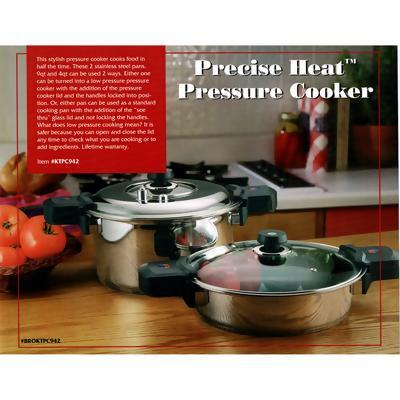 This Precise Heat™ Pressure Cooker Brochure includes instructions for using this versatile cookware set that prepares foods in half the time of standard cooking techniques. MINIMUM ORDER OF 4 PIECES if not ordered with a pressure cooker. Pressure cooker pans Utilize locking handles and a special pressure cooker lid. Low pressure cooking Allows you to open and close the lid at any time to check the progress of cooking food or to add ingredients. Versatile pans Can also be used for standard cooking by using the "see through" glass lids. Instructions On how to use and take care of pressure cooker pans. -- On how to cook in them and save time in the kitchen.